The open source AllSeen Alliance has just pulled ahead in the Internet of Things standards race: Running code connects local IoT networks to cloud services, with security and privacy. 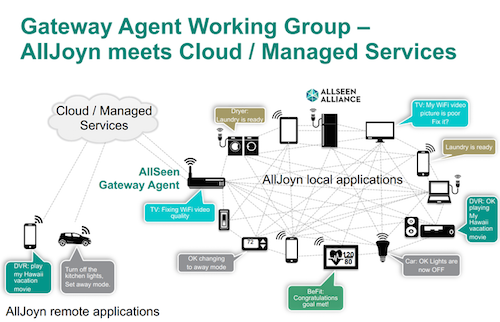 At the Consumer Electronics Show in Las Vegas, which we previewed late last year, AllSeen announced the AllJoyn Gateway Agent. AllJoyn refers to a software framework by which applications can discover, talk to, and control IoT devices inside a single network. It is now an open-source project administered by the Linux Foundation, based on code initially developed inside Qualcomm and premiered at the Mobile World Congress in 2011. The AllSeen Alliance exists to promote AllJoyn into widespread use. Founded by Qualcomm, its members include Microsoft, Panasonic, LG, Sharp, Cisco, Fon, HTC, Haier, LIFX, Foxconn, Technicolor, Electrolux, Sears, and many others. The AllJoyn Gateway Agent is different. It mediates between devices inside an AllJoyn network and the outside world -- whether that be another AllJoyn network, a "personal area network" formed by a person's mobile and wearable devices, or a cloud service out on the wider Internet. The gateway provides "remote access, device management, and fine-grained security and privacy control," according to the release announcement. In-network standards include the Thread Group, led by Google's Nest division, whose technology relies upon the IPv6-based 6LoWPAN, and the ZigBee Alliance, whose interconnect technology is built around the IEEE 802.15.4 wireless networking standard. Other contenders, built by and controlled by a single company, include GE Quirky's Wink, Samsung's SmartThings, and Apple's HomeKit. There are many others. Contenders for internetwork standards at this point consist of the AllSeen Alliance, the Open Interconnect Consortium, and the Industrial Internet Consortium. The latter two are barely at the point of publishing proposed standards, and have no running code. By the criteria on which the Internet itself rose to dominance -- "rough consensus and running code" -- AllSeen is now far ahead of the pack. The AllJoyn Gateway Agent software is meant to run on Internet routers, and at this point it requires heavy-duty technical chops to download, build, and use. Its ideal environment is a router running the OpenWRT firmware, but any Linux router will do. For the strong of heart, here are instructions for the OpenWRT and generic Linux variants. Good luck introducing your Internet of Things to the cloud.